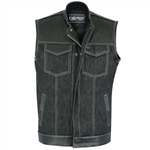 Ride in premium motorcycle style with our selection of men's denim vests and leather biker vests. 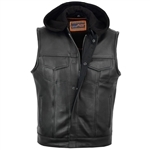 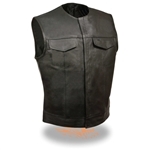 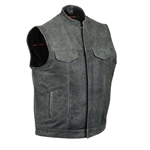 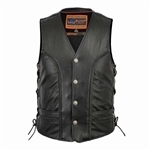 All of our motorcycle club vests, in styles ranging from cowhide leather, to collarless styles, to zip, are made up of high quality, heavy duty leather or denim and protect you from any number of elements you may encounter riding on the open road. 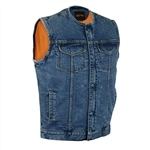 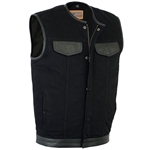 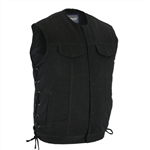 We have the best selection of men's denim vest including classic blue,dark blue and black styles all equip with internal gun concealment pockets and made from durable denim materials in sizes up to 12XL. 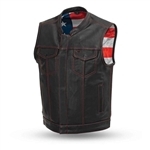 Browse our selection of denim motorcycle vests above, and remember to pair your order with a new men's leather motorcycle jacket found in our complete line of leather apparel.